Part 4 in the series where I take my trusty old Amiga 2500 and continue tricking it out. The need for speed! I install a GVP accelerator card and tidy up the floppy drives. Joined to comment that I think you have installed the 040 board incorrectly. Long time Amigan, but over ten years since I sold my collection. 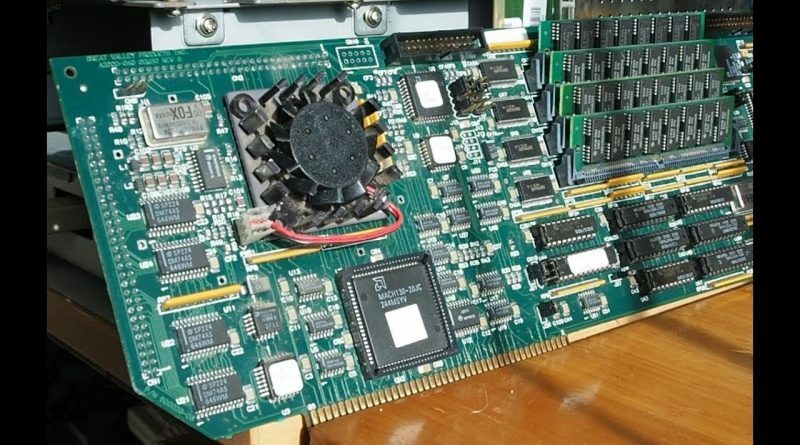 One of my rigs was a tricked out B2000, amongst the other cards inside was a GVP GForce 030/40 – 68030 running at 40MHz, with 16MB 32bit fastram. And it was faster than your readings under Sysinfo (around 3x so, ie 12x faster than stock A2000). * The MMU is enabled. This allows you to relocate/shadow ROM to 32bit fastram on the board. This is an absolute must, leads to a huge performance boost. *Check that Kickstart is being relocated into the cards 32bit fast memory, and not 16bit autoconfig fastram. * Check 040 burst mode is enabled. As I remember, this is key because unlike the 68030, you can’t selectively enable/disable the CPU caches. On the 040, disabling burst mode disables the caches. As these are 4K instruction and data caches, the performance penalty is severe. There is a command to copy to c: and put into s:startup-sequence to do this on bootup. *Check the what model 68040 it is; 68040 has MMU and FPU. 68LC040 has MMU but no FPU, 68EC040 has FPU but no MMU. I doubt GVP ever used the latter, as it would have crippled the card as it would have been unable to relocate Kickstart ROM. *check your memory configuration. As I recall, the bridgeboard occupied 4MB of the 8mb auto-config memory. If you have another expansion card fitted, e.g. a hard disk controller, that will eat another 2MB. GVP cards had the ability to configure their 32bit memory to sit entirely in the 8mb autoconfig area (with a performance hit, iirc, if there was any 16bit fastmem present), some in autoconfig and some as extended, or all as extended memory (best performance). DONT rely on the Big Book of Amiga Hardware, for example the entry listings for much of the GVP 030 range is hideously inaccurate, mixing models and series numbers and types. The Amiga Hardware Database is much clearer, has a better grasp of the GVP product range – although incorrectly lists the G-Force 030/40 as being a 68EC030 (only the 25MHz card used an EC processor). Possibly GVP did switch to EC processors later in the lifecycle, but in 1993 they were using ‘full fat’ 68030. The AHD is also incorrect in stating that the G-Force 040 does not have a Fast-SCSI II controller. ALL the GVP SCSI interfaces were “fast” SCSI-2, because the was no “slow” SCSI-2; the standard for SCSI-2 was 10MHz, it was termed fast because it was faster than the 5MHz SCSI (or ‘SCSI-1″) bus. The GVP 68030/40 outperformed the A4000/030. The GVP 68040/33 outperformed the A4000/040. Your 2500’s SysInfo scores should be about 3 times faster than they are. My A2000 started with a Supra Wordsync with a “massive” 80MB SCSI drive and Multiface-III, SuperCard Ami-II internal, dual floppies, Syquest removable drive (replaced with a 600MB tape streamer), and in one glorious day added an ICD FlickerFreeVideo2, ICD AdSpeed 14Mhz 68000, and a GVP G-Force 68030/40 accelerator (not sure what I did with the WordSync!) and in 1994/5 a GoldenGate 2+ BridgeCard and a Picasso II+ In 1995 I was also a beta tester for Siamese System – lovely on that ‘mig! Put it all on ebay in 2006 for £75, as I had two tricked out A4000s and an A1200. It sold in 45 minutes to a guy in Australia, who paid £145 for shipping, and in the intervening 3 months it took to arrive bought an A4000/030! I miss that rig! Kept the SuperCard and Siamese though. One tower with a Cyberstorm PPC/060, Cybervision 64-3D, GVP I/O. And a Prometheus PCI expansion card, which I never really got round to using. Sold both over the course of a year in 2007/8. Oddly enough, to the same person! The A1200 was in a tower with an 060 card, a display doubler, CD-ROM, and some PC expansion slot board. Cant really remember which went into which machine now, as I had boards from Eagle and Elbox (shuttle and mediator) as well as a spare tower. Apologies for the long comment. But felt the need to point out that your 040 card should be performing much faster, and then got on a roll. Oh, try to avoid using the external 25pin SCSI port; its an abortion of an Apple “hack”, as the 8 data pins are tied to one common ground pin instead of being tied to their own ground (on the full 50 pin interface almost all odd pins are ground, giving every signal pin a corresponding ground pin).